Located on the action packed Pigeon Forge Parkway, The Track Pigeon Forge, TN provides hours of entertainment for entire family! Those looking for kid friendly activities in Pigeon Forge will love the The Track in Pigeon Forge kiddie rides and family friendly atmosphere. With go-karts, thrill rides, an arcade, mini-golf, carnival rides, and more, the kids (or the kid at heart) will find fun-filled activities galore at The Track Pigeon Forge, TN! 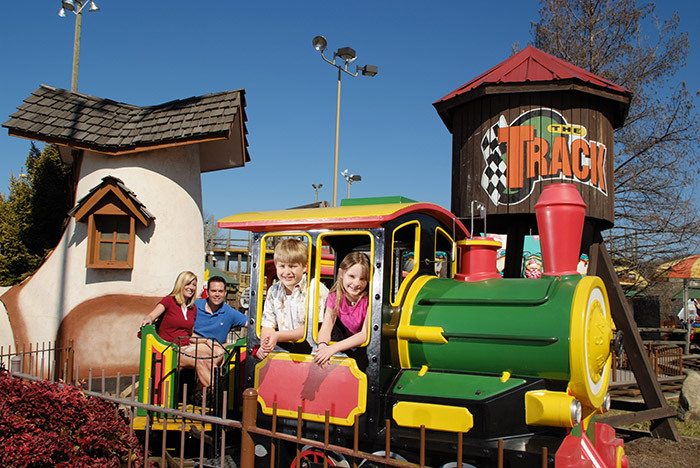 The Track Pigeon Forge, TN offers 4 different tracks for everyone in the family. Let that speed demon loose when you get behind the wheel of one of The Track in Pigeon Forge's speedy go-karts. Whether you chose to speed up the spirals of The Wild Woody, a wooden track that loops up, or speed around the curves of The Track, a classic track with an overpass, these Pigeon Forge go-karts will have everyone racing like its Daytona. For the "Jr."s of the family, the Kiddie Track and Rookie Track provide an opportunity to race just like the adults! Kids only have to be 3 feet tall to ride the Kiddie Track and 4 feet tall for the Rookie Track. Who knows the next big NASCAR star may discover his or her love of racing at The Track Pigeon Forge, TN! Mini-Golf in Pigeon Forge is a time-honored tradition for a Smoky Mountain vacation. The Track Pigeon Forge, TN offers an 18-hole, jungle-themed course for your family's entertainment. Unlike most mini-golf in Pigeon Forge, the fun doesn't end at the last hole. The fun simply continues with The Track Pigeon Forge TN's other activities. The Track in Pigeon Forge Arcade, Bumper Rides and Daring Thrill Rides! After playing some mini-golf, step into the flashing lights, whirls, and buzzes of this Pigeon Forge arcade for hours of exciting games. Collect tickets as you rack up the points on your favorite games. From racing games to ski ball, revisit the golden age of the arcade at this Pigeon Forge arcade. Once you've collected your prizes,head out for an adrenaline pumping experience with one of The Track Pigeon Forge TN's daring thrill rides. Take a 65 ft plunge on the bungee jump or feel like your skydiving on SkyFlyer. The Track in Pigeon Forge offers something for the thrill-seeker in the family. Maybe you want a little more competition? Enjoy The Track Pigeon Forge TN's bumper rides. Knock out your opponent on the bumper cars or splash them in the bumper boats. Everyone in the family is sure to have a great laugh with The Track's bumper rides. With so much to do in one place, it's no surprise that many families visiting the Smokies choose The Track in Pigeon Forge for their family fun park adventures. This family fun park also offers several point packages that never expire, so that you can use left over points towards your next visit to the Smoky Mountains. After a fun-filled day at The Track Pigeon Forge, TN, come back to one of Cabins USA's Pigeon Forge cabins with arcades games to keep the fun going! Our cabins' game rooms provide everything from standing arcade games to pool tables, allowing you to have as much fun (if not more) in your vacation cabin rental.